These delicious cookies were my second choice from last Sunday’s Secret Recipe Club reveal. 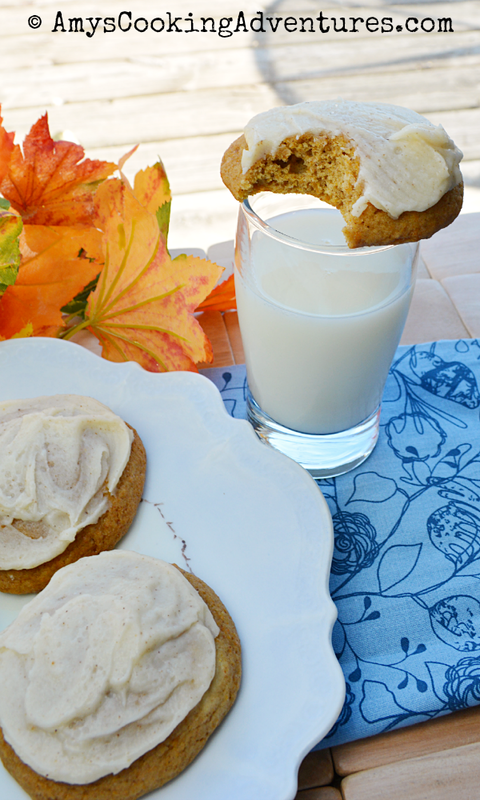 The cookies are so soft and cakey and browned butter icing perfectly complements the spicy pumpkin cookies. Basically, these are to die for! It’s the perfect fall cookie or addition to the Thanksgiving table! Preheat oven to 375 degrees F and line 2 baking sheets with silicone baking mats or parchment paper. In the bowl of a stand mixer, beat the butter and brown sugar until light and fluffy. Beat in the egg. Then, reduce speed to low and add the pumpkin, evaporated milk, and vanilla. Mix until well blended. Add in the dry ingredients and mix until combine (note that if your pumpkin is watery (ie has been frozen and thawed) you may need more flour). Use a medium cookie scoop (about 2 tablespoons) to scoop the dough onto the prepared cookie sheets. Bake the cookies for 10-12 minutes or until puffy and cake-like. Cool for 5 minutes on the pans, then, move to wire racks and cool completely. While the cookies bake, melt the butter in a small saucepan over medium heat and cook until golden-brown. Set aside to cool slightly. Pour the browned butter into a bowl with the confectioner’s sugar and stir to combine. Add the vanilla. Add in the evaporated milk, bit by bit, until the icing reaches the desired consistency. Once the cookies are cooled, spread each cookie generously with icing and sprinkle with sea salt. So happy that you liked the cookies. The frosting really makes them special. I had a hard time not eating the frosting as it made its way to the cookies!